These 14K yellow gold bar earrings from Apples of Gold Jewelry are an interesting, yet sophisticated, way to show off your love of simplistic and beautiful earrings. 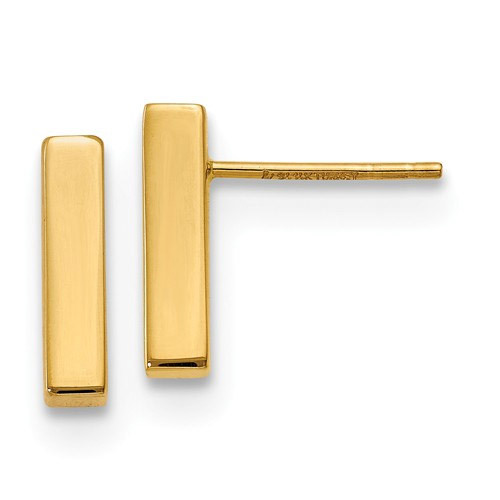 Made from a warm 14K yellow gold, these earrings feature a simple rectangle and a post with a push back closure to help keep the earrings securely in place. The yellow gold features a polished finish that shines, and each earring measures 1/2 inch tall and is 3mm wide (0.11 inches wide), making them an ideal size to wear for a variety of occasions. We guarantee our 14K Yellow Gold Bar Earrings to be high quality, authentic jewelry, as described above.